Given how bad the weather was last weekend, Jase and I decided not to have a crack at our planned Daft Ride, so instead I introduced him to all my favourite “local” hills on a mostly road based ride round Pendle, Bowland and such places. We burst out of Preston after about 20mins of riding through “shanty towns” (Jase’s words) and rolling over the motorway bridge that signals the end of the horrible traffic and the sudden start of quieter country lanes. Cruising out through Longridge and along the fast B roads over towards Clitheroe it became apparent that what would normally be a fantastically scenic ride would instead be several hours of staring at a dull grey expanse as everything was enveloped in cloud and mist. It wasn’t raining though, which was a nice suprise…well, it would have been if I hadn’t been dressed to stay warm in the heavy downpours that had been forecast – I was boiling! I started commentary about 15miles in, pointing off into the murk at where views of hills, dales and general country scenery would usually be, possibly seeming a bit over enthusiastic and took great delight in pointing out the shortest quarter mile in the world, where two road signs, on opposite sides of the road claim that Clitheroe is “1 1/2” miles and “1 1/4” miles away, somehow at the same time. Jase just looked a bit confused. Through Clitheroe and over the A59, which is often the last time you have to put your foot down for a good 5 or 6 hours, the fast roads stop. Suddenly. I politely mentioned this to Jase by muttering “well that’s the easy bit of the ride over with”, which understated the change in the character of the ride greatly, as we hit the lower slopes of the climb over the Nick o Pendle and ground our way upwards towards Sabden. Past the Most Remote Restaraunt in the World (possibly) and still climbing, I got back to pointing out just how many views were missing in between gasping for air and as we crested the summit I thought I should do the right thing and warn of the descent down into Sabden. “It’s really fast”, I said, once again underplaying a drop on which you can easily hit 60mph (when you can see where you’re going) on. The descent lasts just long enough to chill the sweat you’ve built up on the climb before you roll out through the village and straight into a nice 1 in 6 climb straight up onto the next ridge behind Pendle Hill. Our cyclocross tyres squealed and slithered on the damp tarmac as we leant right over the bars and resumed clawing in great lungfuls of air to get us up the slope for the best part of half a mile. Onto the ridge and heading towards Newchurch in Pendle, I decided not to point out the signpost for “Roughlee 3/4mile” and make the “does that means it’s roughly 3/4 of a mile away then” joke I think to myself every time I ride past it, worrying that maybe I’d spent a little too much time out on the hills by myself and would come across as some sort of mentalist. Insterad I took great delight in describing the next steep climb up to Newchurch in Pendle itself just as we hit it and grovelled up it into even thicker cloud. Newchurch is very much steeped in the whole “Pendle Witches” mythology and you can see why it was believed dark, occult things used to go on. The atmosphere in the shadow of Pendle Hill seems dark and oppressive…and it’s not helped by the spooky Witches shop, full of severed hands, jars of eye of newt and pentagrams (well, maybe not so many severed hands) which seemed to take Jason by suprise as we ground out up yet another steep little climb, before plummeting back downwards into Barley. The rhythm of the past hour or so continued as we climbed back up out of Barley, grinding upwards as I continued to point off into the invisible distance at distant views that just weren’t there and then dropping back down more fast descents into Downham and then onwards through Chatburn towards Waddington. I felt like I should make a comment about something on the ride that was still visable so highlighted the sheer number of lovely quaint country pubs we’d ridden past and how easy it would be to turn the ride into the toughest pub crawl ever. We cruised past the Clitheroe cement factory, blighting what would otherwise be another lovely view (if you could see it, which we couldn’t), through Waddington and it’s frigheningly expensive houses and up Waddington Fell, past the Moorcock Inn – a pub situated two thirds of the way up the climb, just before the steeper sections kick in that always looks wonderfully inviting. Luckily for us it was closed, so we had no choice but to push on over the top and down another fast descent into Newton in Bowland, our progress stopped only by the Most Remote Roadworks in the World (possibly). Through Slaidburn and up towards Tatham Fell, we would normally have been greeted with views across to Gisburn Forest and ahead towards Ingleborough but on this occasion all we were met with was ever thickening cloud and a subtle appearance of some drizzle. Jason struggled to chew and swallow a Clif bar as the constant short, steep little climbs battered us one after another and as we hit the ascent up towards the Cross of Greet we both relished the chance to sit down and settle into a rhythm for 10 minutes or so of steady climbing. with Ingleborough and Whernside off to our side). Jase described it as like “being in a radio 4 programme”. We made it down to Wray suitably chilled to the bone before ducking down a tiny backstreet and hitting the first in a series of properly steep little climbs. Not that any of the climbs thus far hadn’t been steep, but these area special kind of steep, topping out at somewhere around 25% with enough corners in to prevent you working out where the top of each one is, so for anyone who hasn’t ridden them before it’s impossible to guage how much further you’ve got to grovel and suffer before the road evens out for you. It’s normally utterly empty but for some reason that day we had to creep past several people and a landrover before I felt I could start highlighting the remoteness of where we were (which I had to do as we still couldn’t see anything). I’d long decided that the planned trip over Dunsop Fell wouldn’t be such a good idea – the route over the top of the fell is a shin deep slog through a bog in the height of summer, so on this occasion it would be nothing short of awful…even more so if there were no views to make up for it – so we dropped down off the track and began to make our way homewards through Newton in Bowland to Dunsop Bridge, where we felt the need for a brew stop in the quaint little cafe. The brew, as lovely as it was, seemed very wet, so we had to soak it up with a nice piece of flapjack before heading back out into the now more persistant rain along roads that I rarely get to see in the daylight (they’re usually ridden after work in the dark) past the posh looking Inn at Whitewell – there was only one porsche parked outside it on that occasion, with a few beemers and mercs dotted about the place, but it’s often the case that you can barely squeeze a bike along the road for all the bentley’s, rolls’ and the like – over a few more gentle climbs and into Chipping. Before cruising back into Longridge along increasingly flat roads and retracing our steps over the motorway and back into Preston. Despite cutting the slog over Dunsop Fell out of the route (and partly because of the wind) the 99.93 mile ride still took us 8 hours to get round, with somewhere in excess of 9999ft of climbing in it (my computer only goes up to 9999ft sadly). We didn’t bother doing laps of the house to get the 0.07 miles needed to turn the ride into a century, favouring getting changed into warm, dry clothes and downing some coffeee in double quick time instead. Damn that was good fun! You wouldn’t have believed it to look at me during the race, but I enjoyed every second of it. The flat out HAMMER IT attitude. Every corner making every tendon tighten as you fought with what little grip you had to fire the bike forward. Elbow to elbow down the straights. Great fun. It brought back all the memories of the old Leisure Lakes XC races – about an hour of chasing your max heart rate and ignoring the burning sensation in your legs and searing pain as bits of your lungs you’ve never used before get torn open as you gasp for air. Sadly I’ve not got the top end speed I used to have, so I was never ‘in it to win it’ but it was still ace fun, with loads of personal battles to get fully engaged it (though I never took it seriously enough to get as angry and shouty as some of the other racers – in fact I had a bloody good laugh with a few people). Rather stupidly I didn’t drop any pressure out of the tyres before the race and hitting the off camber roots with 40psi in the tyres saw me flailing around on the ground many, many times. 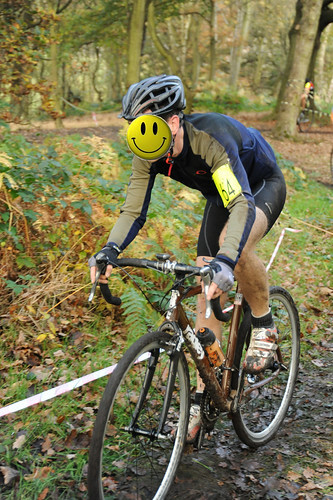 But as it was my first ‘traditional’ cross race since, erm, last January (and even then I wasn’t at full tilt, what with having a longish ride home afterwards) I’ll let myself off with that rookie mistake and add it to the growing list of things to remember for next time..next time being next weekend as I can’t wait to get back out there and do it all again. Apart from that the bike was utterly awesome – you’d probably expect me to say that, I know, but it was – light, flickable, FAST, could be a handful if you weren’t ‘on it’ (but was sooo responsive when you were) and rather natty looking too!